Day One at RSA Conference 2010 was filled with Cloud talk. All the keynotes referenced it and there were a number of new products and alliances announced. As is usually the case when he takes the stage, Whit Diffie stole the show. 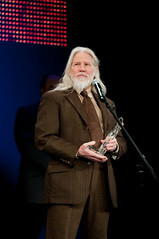 Diffie was award the Lifetime Achievement Award and participated in the Cryptographers’ Panel. Seems like all that I can blog about for a year is the RSA Conference. There are draft posts in my queue (mobile device encryption, Apple TV 2.0, data protection in Europe and a few more), but they never seem to finish themselves. I blame Twitter. For those interested, here are photos from RSA Conference Europe 2009.